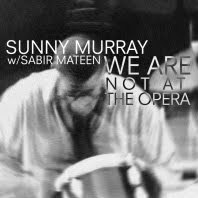 Many if not most of the readers of this blog will know that drummer Sunny Murray is the godfather of “free” drumming. He played with critically important improvisers of the new thing musical explosion in the early sixties (like Ayler, Taylor) and he developed a uniquely effective “freetime” style, one that rarely stated an overt pulse, but proffered a running commentary and complement to the solos and bass punctuations. That’s textbook fact. But listen to him in an especially exposed situation of duet or trio and you realize (if you didn’t before) that he gets his own sound on the drums too. The cymbals and hi-hat don’t ride as much as they speak in tones. And the same applies to the bass drum, snare and toms. It’s drum melody, noise/pitch composing of the spontaneous kind. First off, Sabir is in excellent form, jumping from alto to tenor to flute and always fruitful with free ideas and sounds. Sunny too gets his A-game going. The sound of the drums are quite beautfully Murray-esque, thundering, setting up a wave of sound, making free melody in tandem with Mr. Mateen’s lucid speechifying. Something else too, as anyone who’s listened to Murray through the years knows: he does fall into loose pulses as he feels the urge, and he does them swingingly but wide open in terms of feel.